Chipmunks are those tiny, furry, four-legged critters that strikingly resemble a squirrel. As something that is so cute and seemingly harmless, why would anyone want to get rid of them? Well, the harsh truth is that chipmunks are known to be quite the pest. Not only do they love to dig holes and tunnels underground, turning your lawn into an unsightly disaster, they also have a habit of digging for roots and tubers, and eating young shoots and leaves. Furthermore, they can enter into the living quarters of your home and cause all sorts of unhygienic and unsafe destruction. Anyone who appreciates their landscaping and curb appeal will agree that getting rid of a nuisance chipmunk problem is a top priority. 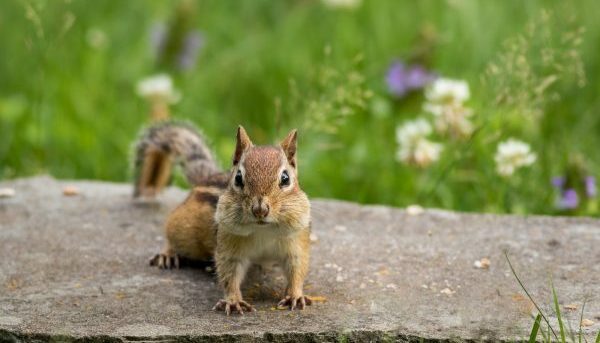 If you have noticed an increase in chipmunk activity on your property, continue reading to learn what you can do to put a stop to it, pronto. There are several spices and scents that chipmunks detest. These include menthol, eucalyptus, spearmint, cayenne pepper, black pepper, red pepper, and anything else with a similar scent or taste. When mixed with water, you have yourself a homemade, non-toxic repellent! Whether in powder or oil of essence form, you can combine your choice of these ingredients with clean water and then spray them around the perimeter of your lawn or gardens, or in areas where you have noticed heightened chipmunk activity. Use a plastic spray bottle for easy application, and be sure to reapply after rain. If you have pets that wander outdoors, be sure they are not within reach of the homemade solution. You can make changes to your landscaping to help reduce the amount of chipmunk activity on your property. Start by removing anything that you believe is attracting them, such as bird feeders, bird baths, low hanging branches, and other food, water, and climbing sources. You can also add chipmunk feeders to the outer perimeter of your property to distract them from coming any closer. When nothing has really helped, you need professional intervention. Trust a licensed and insured wildlife removal and control company for safe and humane chipmunk abatement services you can trust. They have the specialized training and permits to provide wildlife rescue and control services, including minor attic restorations, clean up, and more. Call 317-257-2290 for prompt and professional Indianapolis chipmunk removal, anytime. We are DNR licensed wildlife control contractor who offer a wide range of residential and commercial wildlife removal services, including 24 hour emergency service, minor attic restorations, cleanup, free estimates, and more. Call 317-257-2290 to request a free estimate, today. This entry was posted in Chipmunk Removal and tagged chipmunk problem Indianapolis, chipmunk repellent, get rid of chipmunks, Indianapolis chipmunk control, Indianapolis chipmunk removal, tips stop chipmunks. Bookmark the permalink.